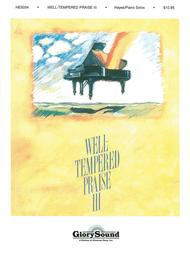 Well-Tempered Praise 3 (Piano Collection). Arranged by Mark Hayes. For Piano/Keyboard. Shawnee Press. Softcover. 48 pages. Shawnee Press #HE5034. Published by Shawnee Press (HL.35025375).ISBN 1592350321. 9x12 inches.Audiences will thrill to the jazz sounds of “Joshua Fit the Battle of Jericho” and the romantic, classical quality of “I Need Thee Every Hour.” For the advanced pianist, Vol. III in the Well-Tempered Praise series is perfect for use in all kinds of worship settings, recitals, and concerts. It contains a well-chosen mix of hymns, spirituals, and contemporary Christian songs, as well as an original composition by Mark Hayes entitled, “Joysong.”.